While moving, you may find yourself in need of a portable storage unit or moving containers. It is important to find the most convenient, secure and cost-efficient self-storage company for you. These units were originally designed out of weatherproof steel to carry goods internationally and across the ocean. Nowadays, there are plenty of portable storage and moving container companies that offer temporary storage for residential moves as well as office relocation and other commercial moving. Check out our list of the best moving container and storage companies. PODS is one of the leading storage unit companies. They are known for customizing their service based on your need -- making it easy for you to move and store your belongings. PODS provides drivers for moving and facilities for off-site storage. The containers comes in three convenient sizes for the smallest to the largest items. You can also mix-and-match different container sizes based on your belongings. They have a level loading system which does not require ramps for loading or unloading. 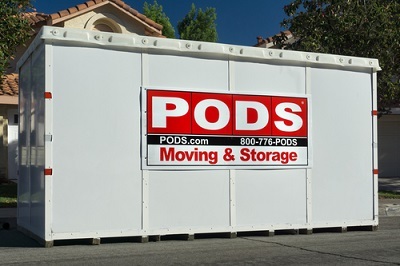 PODS employees drive the container to your new location for you, so you have one less thing to worry about. In addition, they have many packing options -- different box sizes, wardrobe kits and other packing supplies available to help you pack and secure your items better. Almost everyone has heard of U-Haul before, especially since you are likely to spot one of their trucks driving by. It is one of the most popular storage and container companies in the market. Not only do they have storage and containers for moving, they also provide rentals. U-Box shipping containers are for either moving or storage and can even be shipped internationally. If you need physical help moving your items along with a storage space, U-Haul offers that as well. With U-Pack, you control what space you use and the exact price of the space you are using. U-Pack's containers, known as ReloCubes, come with 305 cubic feet of internal space which is ample space to store an entire room's worth of furniture and other items. These containers can hold up to 2,500 pounds of items and are compact enough to fit into a standard sized driveway. ReloCubes are delivered through either a flatbed trailer delivery or a drop-deck trailer delivery. If you need a larger container, they have a moving trailer option as well to fit more of your belongings. 1-800-Pack-Rat conveniently lets you store your items in a simple way. They have both residential and business solutions for your storage needs. With facilities nationwide, this company will deliver the storage unit to your home, so you can load the unit at your pace and at your own timeline. They will then pick up the packed unit and transport it to your own storage room. 1-800-Pack-Rat eliminates the hassle of driving to and from a storage unit. SmartBox is a great solution for you if you are looking for a portable storage container. The SmartBox containers are very roomy and spacious, having dimensions of 8'x7'x5' which can hold up to 3,000 pounds. This large unit can be very helpful, because it gives you ample space and makes it easier to organize your belongings. SmartBox only requires you to pay for the space to use, so you don't have to worry about paying for the entire unit. These storage units give you room for many options depending on your needs such as long-term, on-site, seasonal, temporary, business and residential storage. Zippy Shell delivers a mobile storage straight to your home -- whenever or wherever you need it. You can skip the hauling and work at your own pace with Zippy Shell. Aside from providing ease of access, the shipping containers can also fit anywhere, even city streets. This is good news to those who live in narrower urban areas, since many other companies may not have that feature. Go Mini's is a moving and portable storage company that is dependable and fast. They work in three very simple steps: delivery, load and pick up. Go Mini's containers come in three lengths: 12', 16', and 20' which are 8 inches off the ground. This makes it easy for you to load and unload your items. Another perk is that Go Mini's unit containers are designed with padded wheels to stay on and protect your driveway. Units is a great choice to accommodate your storage needs with friendly customer service and affordable rates. Their storage containers come in two sizes, 12' and 16' with the option of a long-term or short-term storage. Not only does Units deliver the storage container to your desired location in a timely fashion, they also have easy access to off-site storage. Whether you need short or long-term storage, renting a moving container from Big Steel Box may be the way to go. Their goal is to provide you with the best storage solution to fit your budget. Big Steel Box delivers your container straight to your doorstep, so you don't have to worry about running to a storage locker. These shipping containers come in large sizes as well at 8' and 10'. This company is also uniquely provides you with shelving and other accessories for the interior of your container to make storing as efficient as possible. Not only does ModSpace offer moving container rental, they also have mobile containers for offices, complexes and even classrooms. They also gives you the option for a custom construction using their containers. Their mobile storage containers are guaranteed on-time delivery, and they keep exceptional customer service making it ideal for storing your belongings. Mayflower's storage services provide solutions for residential and commercial needs -- and anything in between. Their containers come in all sorts of sizes which are all made out of durable steel with aluminum side panels. This provides your valuable belongings with extra security. The steel will protect your items from any type of water damage. They are very flexible with your moving schedule and do their best to accommodate to your hectic moving days. United Mayflower stores your items in their units and then move them into your new location whenever you are ready. One of COWs biggest goals is to provide a better storage experience for you. They work very closely with their container designers to engineer units that are efficient to load and unload. They are locally owned and operated with over 100 locations nationwide. All COWs containers come in two types of residential containers: the classic steel framed containers and wooden boxes. Aside from their steel framed containers, the wood containers are all manufactured right here in the USA. Just like other companies, Cool Box Portable Storage delivers your container directly to your driveway. The only exception is that these containers are specially designed to be insulated. This means that each storage unit stays at a temptation that is 10 to 15 degrees warmer in the summer and cooler in the winter. They come in three different sizes from small to large and you can use your own lock to secure the container instead of having to use the company’s lock. Cool Box Portable Storage also accommodates those whose relocations are taking longer than expected. They can store your container at one of their secured yards with no extra costs for as long as you need.